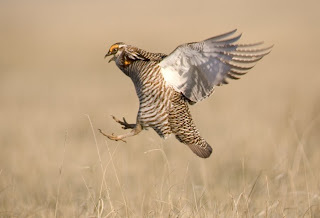 One of the more unique wildlife photography opportunities in South Dakota happens each spring when the prairie chickens and sharp-tailed grouse put on elaborate courtship dances and displays. Both species of birds perform these rituals in small plots of land they return to each year called "booming grounds" or "leks." 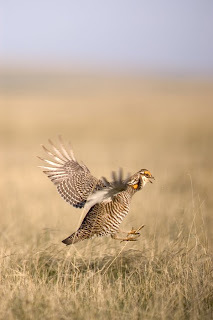 Lucky for us photographers that the U.S. Forest Service has identified several of these areas within the Fort Pierre National Grasslands in the central part of the state. Not only that, but they erect small plywood viewing blinds at the booming grounds and take reservations for their use. I know in my last post I said I almost never use blinds for my wildlife photos. Well, this is one of the exceptions because it is about the only way to ensure you will get good pictures. The blinds are typically available from mid-April through May, depending on weather and bird behavior. The Fort Pierre Grasslands are accessed off Highway 83 south of the town of Fort Pierre. Reservation information and contact data is available at http://www.fs.fed.us/r2/nebraska/contact/forest_grassland_offices/offices.shtml. According to the Forest Service, the blinds will hold four people "comfortably." I would say two photographers with gear is a bit cramped, but works. The blinds have several rectangular holes cut at various heights in the walls with vinyl flaps covering them. The holes are just big enough for most telephotos. My ancient 600mm/f4 does not quite fit through, but it has worked for me. There are four folding canvas stools in each blind. After making reservations, you will receive written directions and maps to find the blind you have been assigned. It is very smart to find it the afternoon before your reserved photo day as they are off gravel roads in the middle of the prairie. To assure that the birds will not be frightened off by your presence, arriving early is a must - about an hour and 15 minutes before sunrise. Spend that time before shooting light to get situated in the blind and settle in quietly. Once the show starts you will most likely be shooting intensely for an hour or so. Unearthly booming sounds emanate from the air sacs that inflate along the birds' necks. If you are lucky enough to have several males around the blind, you may observe much posturing, threatening, and even outright battling. The birds leap into the air, flap their wings and kick out with their legs. A large zoom lens is ideal, because you have no idea how close or far the birds may be. All the pictures here were taken with the 600mm. I've had other photographers tell me they have had prairie chickens on the roof of the blind, so the flexibility of a zoom will help. If it's raining or the wind is blowing more than 15 mph, the birds may not do their thing. Then it's time to pack it up and go call for another blind reservation. Other supplies to have along include warm clothing, coffee or other hot beverages, and snack bars. It gets to be a while, cramped in an unheated box. Also, bring a plastic ground cloth of some kind to set gear on. The floor of the blinds is the South Dakota prairie. If it's a wet spring, the floor is also going to be wet. Many thanks for Dustin over at the SD Travel Blog - for pointing out this great blog. I'll be telling a lot of people to stop by here to see some absolutely awesome photographs of the beauties of the State. Thanks to you for sharing your amazing talent with a camera! Thanks Patty. I'm glad you are enjoying what you see here. I'll try to keep coming up with interesting topics.